Last week while I stayed at the boyfriend's awesome house in Westchester, we had a lovely bagel breakfast when the giant family arrived very early on Thanksgiving from the city to avoid traffic. We still managed to have quite a few leftover from the GARBAGE BAGS FULL of bagels that the family brought with them. 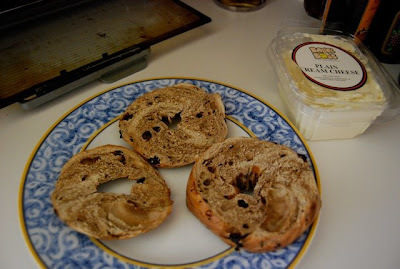 The next morning, I was waking up and checking email in the kitchen when one of his sisters came downstairs to grab herself a bagel and she did the most amazing thing I've ever seen done with a bagel. Instead of two halves, she sliced the bagel into 3 slivers! So brilliant! So simple! As a lover of cream cheese, as in, I used to eat the individual packets sold at Costco that my dad would stock his fridge with as snacks, this is 50% more surface area and is the perfect excuse to eat 50% more cream cheese with one bagel. Because I start to feel guilty when I pile more than about half an inch of cream cheese on one bagel slice. Also people tend to get upset when the entire container of cream cheese is gone, but more than half the bagels are still left.